3. In the event that the delivery address given by the customer is incorrect/incomplete, it is purely voluntary that kalidades will contact client to correct any error in delivery details encoded by the client but is under no lawful obligation to do so. This is not considered as a procedural step. If client does not respond, last option is to contact the recipient for advise on the correct delivery address. 4. For unsuccessful 1st attempt of delivery, flowers will be brought back to the shop and our staff will try its best to contact recipient for item be picked up. 5. Kalidades will deliver 48 hrs after order placement to allow time for order processing. 6. We are committed to deliver on the day requested but are not committed to deliver on any specific hour within that day. However, should a specified time be requested, Kalidades will do its best to meet the requested time. Delivery time for non peak days is between 10am-6pm. 7. Upon ordering and placing a desired delivery date, the sender will receive an e-mail confirmation that the order has been processed. If for any reason, we cannot meet the desired delivery date, client will be informed through email. Before ordering, we advise all clients to please refer to the Delivery Days calendar to find a suitable date of delivery. Our arrangers will use only the freshest flowers, If the specified flower is not available due to seasonal/regional inavailability, kalidades has the option to substitute the flower with another variety of equal or greater which will give the same impact for the arrangement. 1. Orders that fall on a Holiday will be delivered the next working day. Flowers and Harana Service is considered delivered if due to the absence of the receiver within 30 mins- 1 Hour. It is not be possible to request a sudden change of date since we need to prepare all of this in advanced, That is why we recommend you to book this Service 5 Days before the delivery. Any requests made less than 5 days is pending approval or subject to approval, if no response is received from our staff that means request is declined. Booking change of date should be done 3 days (excluding Saturdays, Sundays and Holidays) before the delivery date, or we will consider this as final and we will not grant a refund. We will try our best to play 3 of your top 5 songs, however Kalidades Harana reserves the right to change songs to one that is of the same genre to what you have chosen in the instance that our Haranista may not be familiar with your choices. How can I pay without Paypal Account? You may pay without Paypal account, although the payment process is made in Paypal (for your Security and ours we use PAYPAL) you don’t have to sign-up for an account. After clicking the link (see Screenshot below) you have to input your Credit Card/Debit Card Info and that’s it. Your payment is securely made using Paypal. Where should I send my payment if using Bank Transfer Option? Where should I send my payment if using Money Transfer Option? Sorry! We don’t cater anymore Money Transfer Payments effective Oct. 3 2016. What will happen if delivery wont be able to locate recipient's address? We are trying our very best to locate recipient’s address based on customer information, but if we fail to locate recipients address (even if by asking city and barangay halls) we will then have to call recipient to ask for more specific details. If address is within Cebu City we can deliver flowers again, for cities outside Cebu City , option would be to have the flowers picked up on our shop or to deliver the flowers during other deliveries that are at the same route with the delivery address. To avoid this situation, pls give us more specific details (e.g landmark, gate color, house number, house color, other details) for a more efficient delivery. Do I get a refund if recipient refuses to accept flowers? In situations like this, we will inform customer, but we will not grant a refund. Where can I pay if I have issues on Shipping Payments and Other Payment Issues? 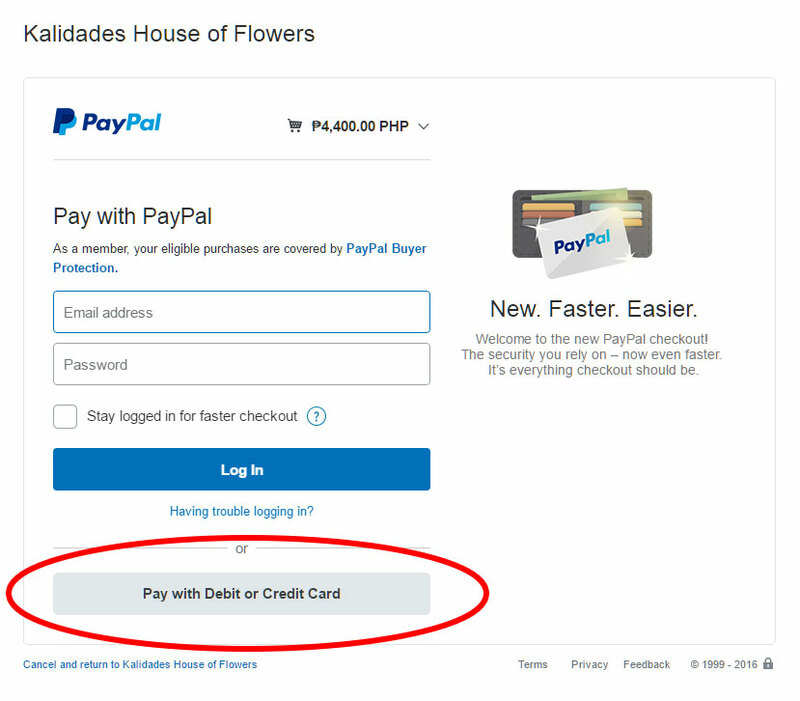 You may be able to pay online in case you forgot to add Shipping Payments, or if you want to pay for other Payment Issues by clicking here or visit this page https://www.kalidades.com/payments. How do I avail of the Harana? Please be informed that we need the payment to confirm the haranista’s schedule. Where can I pay for Harana Request? You may pay your Harana Request by clicking here or going to this address https://www.kalidades.com/payments.